Linux mini-computers PC current build. Sense mini PC. Mini in size only this a mainstream computer! This build with the included parts below is our current technology standard for a low cost excellent mainstream mini computer. If you want to customize any part below, no problem, just contact us. All our PCs are shipped fully assembled with operating system pre-installed ready to plug in and start, unless some one specifically asks for a PC assembly project for a fun learning experience. The Sense mini PC is designed for casual games, streaming movies and video, music, photos, web browsing, social media and for work! Low wattage power efficient fast CPU, excellent integrated graphics, ample memory, feature rich motherboard, fast storage, great looking small case, quality PSU and all the connectors you need! Included parts in your Sense mini PC! Multi-task at fast speeds with this low wattage dual core Intel Gemini Lake architecture CPU! See how we choose a CPU. Graphics Base Frequency 250 MHz, Graphics Max Dynamic Frequency 700 MHz, 4K support, DirectX support, OpenGL support, up to 3 displays supported. Save the expense of a separate video card with advanced Intel integrated UHD graphics! See how we choose a video card. Enough memory but you can increase memory anytime you might need up to 8 GB! See how we choose memory. ASUS Thin Mini-ITX motherboard, includes Intel Celeron Processor J4005 detailed above. Dual channel 2 UDIMM memory slots DDR4-2400 non-ECC unbuffered memory up to 8 GB maximum. 1 M.2 socket supports PCIe 2.0 x2 M.2 SSD, 2 SATA 6Gb/s ports. 1 M.2 socket supports optional 2230 WiFi/BT module. HDMI port (max. resoultion 4096 x 2304 @ 24Hz), VGA port (max. resolution 1920 x 1200 @ 60 Hz). 6 USB 3.1 Gen1 ports (2 at case front, 2 at case rear, 2 optionally available by a header), 4 USB 2.0 ports (2 at case rear, 2 optionally available by a header). 8 channel HD Audio Realtek ALC887-VD2, 3 audio jacks. 1 Gigabit LAN Realtek RTL8111H with RJ45 ethernet port, 1 COM port and more features! Wow! This small rock solid feature rich motherboard is the foundation of your PC. See how we choose a motherboard. With movie streaming and USB flash drives a DVD player and writer is less important, so we've dropped it to keep the price of this PC low. By the way a DVD drive can always be added anytime in the future, either internal or external. 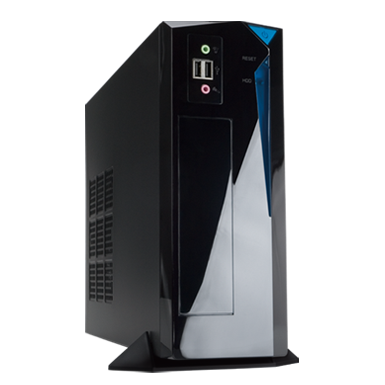 Small form factor Mini-ITX case, black, front ports 2 USB 3.0, HD Audio, Mic, 80 mm case fan. For case rear ports including USB, LAN/ethernet, audio and display ports please see motherboard section. Stay cool with a great looking case so small it'll fit almost anywhere! 200W high quality standard TFX 12V PSU comes with case above! Power on with a quiet stable PSU with reserve power! December 13, 2018. Upgraded SSD model while changed capacity to 250 GB to make PC more affordable. August 3, 2018. Changed CPU to dual core, motherboard and memory, made PC more affordable. April 5, 2018. Upgraded CPU and GPU to Intel Gemini Lake architecture, upgraded motherboard, memory, case. March 24, 2017. Upgraded CPU and GPU to Intel Apollo Lake architecture, upgraded motherboard! August 24, 2016. Upgraded CPU and motherboard to Intel Braswell Refresh architecture with Intel HD Graphics 400. Changed memory to DDR3L SODIMM. June 21, 2016. Upgraded SSD capacity. April 6, 2016. Asus motherboard. January 13, 2016. Increased SSD capacity and with even faster speeds! Changed case with a larger PSU! December 1, 2015. New smaller case and PSU, a great size for a mini PC. October 6, 2015. Changed motherboard. This one has a VGA port as well as HDMI. September 30, 2015. Changed case, this one looks better, more durable potentially and the previous was in short supply! September 9, 2015. Upgraded CPU to a quad core from a dual core with a corresponding motherboard that has more expansion capabilities. August 7, 2015. Updated SSD size to 128 GB! Changed case and PSU, more reserve power PSU. July 31, 2015. New build with Intel's latest Braswell CPU architecture!